Are you in the need for a fantastic water dispenser for your home? Have you been looking for your ideal water dispenser but have been having difficulty in doing so? Finding the perfect water dispenser for your can be a challenging, long, and tiring process. Whether you are looking to use your water dispenser as a replacement for tap water or as a supplement to tap water, it is important to find the water dispenser model that best represents you and your wants and needs. In this article, we will guide you through the 5 best water dispensers for your home. Each of these water dispensers will give you everything and more for your home water dispensing needs. Take a look and see what is best for you! Why Have a Water Dispenser for Your Home? There are numerous reasons as to why to have a water dispenser for your home. If natural water in your area is in danger of being healthy, safe, and clean for human consumption, you will find tremendous benefit in purchasing a water cooler. This will allow you to keep getting the hot and cold water you need throughout your day without compromising your health and safety. Some areas might have difficulty even accessing clean freshwater to begin with. Maybe it is due to a rural location or a location away from freshwater sources. If this is the case for you, you would benefit from a home water dispenser as this dispenser will be able to provide you with safe water for your daily requirements. Lastly, maybe you just enjoy water from water dispensers more than other water that is available to you (and this is fantastic)! Water dispensers always provide clean and fresh water that is safe for your health, so you will not have to worry about having any harmful contaminants or bacteria present in your water if you are using a water dispenser. 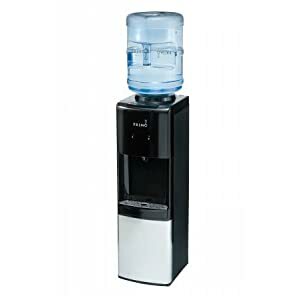 Even more, you might enjoy the taste of water dispenser water more so than other options that are available to you. With these reasons and others that might be true to you, you will soon see that a home water dispenser is exactly what you are looking for! With hundreds upon hundreds of water dispenser readily available to you on the market today, it can be a tricky process to find the water dispenser that is perfect for you and calling out your name.There are key characteristics to be looking for when shopping around for your home water dispenser and when comparing your possible selections together with one another. Bottom loading or top loading water bottles? Purchasing a water dispenser is an investment. Since you will likely not be purchasing water dispensers for your home on a frequent basis, it is important to compare the durability, reliability, and safety of different models you are looking at and interested in to be sure that you find a water dispenser that will last you as long as you would like it to and that will not breakdown over time. Additionally, it is important to see what warranty information is available in the case that your water dispenser would malfunction and need replacing. Many water dispensers available today have special and unique qualities that individualize them from one another, so these would be important to keep in mind as well so you can purchase a device with qualities that align best with your needs. By keeping each of these in mind and by paying attention to them when researching the best water dispenser for your home, you will be able to narrow down your options, thus helping you to select your optimal water dispenser specifically for you. Out of the hundreds of water dispensers that are available to you on the market today, we have narrowed down the list to the five best water dispensers for your home. The five best water dispensers for your home include Avalon’s Water Dispenser, Primo’s Bottom-Loading Water Dispenser, Primo’s Top-Loading Water Dispenser, Honeywell’s Water Dispenser, and Aquaverse’s Water Dispenser. Let’s begin by taking a closer look at each of these best home water dispensers in detail to gain a better understanding of why each will be great for you! Avalon’s Top Loading Water Cooler Dispenser helps set the standard for everything a water dispenser should be. This machine features an innovative and stylish design that will blend perfectly into your home’s existing decor. This beautiful machine has all the functional qualities that you need for your water dispensing wants with everything from piping hot water to freezing cold water provided through secure hot and cold water spouts, child safety features to protect children from potential burns, and easy-to-use user-friendliness. If you are looking for a water dispenser that is as beautiful as it is functional and useful, ideal for your needs, then the Avalon Top Loading Water Cooler is exactly what you have been searching for. With its impressive design and list of terrific features, you will soon see why this water dispenser will be the perfect addition to your home. If high-class and optimum innovation is what you are looking for with your water dispenser, then look no further than the Primo Bottom-Loading Water Dispenser. This water dispenser has some of the latest and greatest technologies in the industry, giving it an impressive list of qualifications that make it extremely user-friendly and fun to operate. This water dispenser is recognized for its bottom loading design meaning that rather than lifting the heavy water bottle up and above the top of the machine to put it into place, the water bottles are held underneath the system so they can easily be slid into place and do not have to be lifted up high. This is a useful feature for individuals who have difficult times lifting heavy objects and/or who are recently injured or are at risk of injury. Furthermore, this water dispenser is self-cleaning, meaning that with the touch of one button, your dispenser will sanitize itself thanks to harmless ozone technology that kills possible present bacteria in the water tanks and in the water lines. This feature is very convenient for the busy individual and the busy family who might not have time to regularly clean their water dispenser as often as they would like or as often as is needed. This water dispenser from Primo is one of the absolute best that you can find today and you can easily see why. If you are looking for the best features in a water dispenser, look no further than this one! Primo also offers a top loading water dispenser where the water bottle is placed on top of the machine like many traditional water dispensers available on the market today. This water dispenser is complete with all the features you need to meet your home water needs for your ideal convenience. 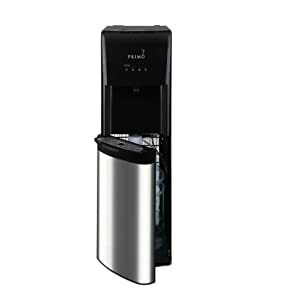 This water dispenser is highlighted by its sleek black and grey design that will fit right into your existing decorations of your home no matter what color scheme you presently have. Primo’s Top-Loading Water Dispenser is all about functionality. It is created to be as useful for you as possible. It is able to provide you with piping hot water and freezing cold water in an instant with its dual dispensing taps. If a simple water dispenser that is easy to use is what you have been looking for, then look no further than Primo’s Top-Loading Water Dispenser. This has everything you need to get the hot and cold water you desire in a simple and effective way! 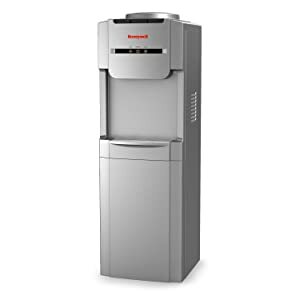 Honeywell offers a fantastic water dispenser made exactly with you in mind. This water dispenser is full of functional features to make it as simple as possible for you to get your hot and cold water. This water dispenser comes standard with an adjustable thermostat control that is able to control the cold water temperature so you can have your cold water at the exact temperature you are desiring. This simple adjustment makes it easy to change if need be. Additionally, Honeywell’s Water Dispenser comes complete with mechanical levels that are easy to use but that reflect children’s safety ideal for the busy family. A drip tray is present in the case of spills and accidents and a unique handle on the back of the machine makes it more easy and comfortable to lift bottles up and into the system when loading. All in all, this is a very good water dispenser for everything you are looking for. This water dispenser will be able to meet all of your needs and give you the solution you have been searching for with your water requirements. Our fifth favorite best water dispenser for your home is the Aquaverse Top-Loading Water Dispenser. This water dispenser is full of your favorite features and would be a great addition to any home, especially homes with big families. This water dispenser is commercial grade, meaning it is extremely durable, reliable, and built with heavy duty construction. Providing you with both very hot and very cold water through respective water taps, this water dispenser is Energy Star rated. It comes complete with patented leak prevention and stainless steel tanks. These all add together with each other to make this water cooler strong and sturdy, but still giving you everything you need and more. If functionality is the key component you are looking for with your water dispenser purchase, then this will be the ideal dispenser for you. It will give you everything you need and even more! As you can see, all of these water dispensers are fantastic machines that will be great for you and your every need, no matter what you are looking for. However, depending upon your particular wants, you might see that a particular water dispenser is calling your name with its special qualities and characteristics. If you are looking for a touch of high-class, I would recommend Primo’s Bottom-Loading Water Dispenser. With advanced technologies that have not yet been seen before on water dispensers, you will soon understand why this machine is quickly becoming one of the best. 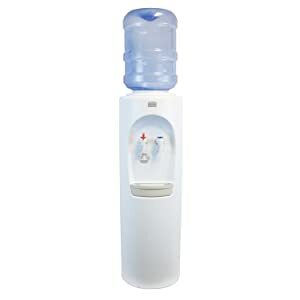 This water dispenser has characteristics and features that are not included on any other dispenser, such as its sanitizing self-cleaning feature, its bottom loading design, and its indicator lights that show you when your hot and cold water is ready and when your water bottle is empty and ready to be changed. These features make this water dispenser as easy to use as possible. Even more, its beautiful design adds a touch of elegance to your already existing decor. 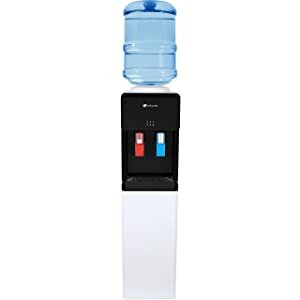 If you are looking for a water dispenser that will be extremely useful for you and that will be durable and reliable over time, then you will find this with all of the water dispensers. Each are created to be long-lasting so you will not have to purchase another one for a very long time. These water dispensers are designed and developed by some of the greatest and most represented brands in the industry, so you can rest assured knowing that each water dispenser presented here will give you your desired solutions for your water troubles. One of the best tips I have for you is to do your research. Research what it is that you are exactly looking for and wanting with your water dispenser. Are there particular requirements that are a must for you and/or are there some features on certain water dispensers that you could live without? First, recognize what it is that you want. What do you want your water dispenser to do for you and provide for you? Are you looking for a simple, basic machine or something more complex with added features? What is the price range you have in mind? How much are you looking to spend? How long do you wish to have your water dispenser? Would a bottom loading or top loading design be more beneficial to you? By answering these questions and additional questions that will begin to come into mind as you think through the research process, you will soon gain an understanding for what you are looking for and what you need from your water dispenser. You can then take this information and apply it to the water dispensers you are looking at investing in. Ultimately, this research will help you find your perfect water dispenser! There are hundreds and hundreds of water dispensers that are readily available to you on the market today. It can be a daunting task trying to find the perfect and best water dispenser for you and for your home. Each dispenser is unique to itself and different from one another, so it takes time to learn about each water dispenser and to see which one might be the right fit for you. In this article, we showed you the five best water dispensers for your home that we would recommend. All of these will give you the best of what you are looking for in a water dispenser. Each of these dispensers is unique unto themselves and they each feature their own qualities that make them special. By taking a closer look at each, you will see what they have to offer you and which one would be the greatest for you. With this information, you will be able to make a sound decision on your next water dispenser to have the best water dispenser for your home! We make it easy to find the best water treatment and purification products for your needs.